Not to be confused with Antipope Innocent III. Pope Innocent was one of the most powerful and influential of the medieval popes. He exerted a wide influence over the Christian states of Europe, claiming supremacy over all of Europe's kings. He was central in supporting the Catholic Church's reforms of ecclesiastical affairs through his decretals and the Fourth Lateran Council. This resulted in a considerable refinement of Western canon law. He is furthermore notable for using interdict and other censures to compel princes to obey his decisions, although these measures were not uniformly successful. Innocent greatly extended the scope of the crusades, directing crusades against Muslim Spain and the Holy Land as well as the Albigensian Crusade against the Cathars in southern France. He organized the Fourth Crusade of 1202–1204, which ended in the disastrous sack of Constantinople. Although the attack on Constantinople went against his explicit orders, and the Crusaders were subsequently excommunicated, Innocent reluctantly accepted this result, seeing it as the will of God to reunite the Latin and Orthodox Churches. In the event, the sack of Constantinople and the subsequent period of Frankokratia led to an increase in the hostility between the Latin and Greek churches. The Byzantine empire was restored in 1261 but it never regained its former strength until its final destruction in 1453. Lotario de' Conti was born in Gavignano, Italy, near Anagni. His father was Count Trasimund of Segni and was a member of a famous house, Conti di Segni (Earl of Segni), which produced nine popes, including Gregory IX, Alexander IV and Innocent XIII. Lotario was the nephew of Pope Clement III; his mother, Claricia Scotti (Romani de Scotti), was from the same noble Roman family. Lotario received his early education in Rome, probably at the Benedictine abbey of St Andrea al Celio, under Peter Ismael; he studied theology in Paris under the theologians Peter of Poitiers, Melior of Pisa, and Peter of Corbeil, and (possibly) jurisprudence in Bologna, according to the Gesta (between 1187 and 1189). As Pope, Lotario was to play a major role in the shaping of canon law through conciliar canons and decretal letters. Shortly after the death of Alexander III (30 August 1181) Lotario returned to Rome and held various ecclesiastical offices during the short reigns of Lucius III, Urban III, Gregory VIII, and Clement III, reaching the rank of Cardinal-Deacon in 1190. As a cardinal, Lotario wrote De miseria humanae conditionis (On the Misery of the Human Condition). The work was very popular for centuries, surviving in more than 700 manuscripts. Although he never returned to the complementary work he intended to write, On the Dignity of Human Nature, Bartolomeo Facio (1400–1457) took up the task writing De excellentia ac praestantia hominis. Celestine III died on 8 January 1198. Before his death he had urged the College of Cardinals to elect Giovanni di San Paolo as his successor, but Lotario de' Conti was elected pope in the ruins of the ancient Septizodium, near the Circus Maximus in Rome after only two ballots on the very day on which Celestine III died. He was only thirty-seven years old at the time. He took the name Innocent III, maybe as a reference to his predecessor Innocent II (1130–1143), who had succeeded in asserting the Papacy's authority over the emperor (in contrast with Celestine III's recent policy). As pope, Innocent III began with a very wide sense of his responsibility and of his authority. During the reign of Pope Innocent III, the papacy was at the height of its powers. He was considered to be the most powerful person in Europe at the time. In 1198, Innocent wrote to the prefect Acerbius and the nobles of Tuscany expressing his support of the medieval political theory of the sun and the moon. His papacy asserted the absolute spiritual authority of his office, while still respecting the temporal authority of kings. The Muslim recapture of Jerusalem in 1187 was to him a divine judgment on the moral lapses of Christian princes. He was also determined to protect what he called "the liberty of the Church" from inroads by secular princes. This determination meant, among other things, that princes should not be involved in the selection of bishops, and it was focused especially on the "patrimonium" of the papacy, the section of central Italy claimed by the popes and later called the Papal States. The patrimonium was routinely threatened by Hohenstaufen German kings who, as Roman emperors, claimed it for themselves. The Holy Roman Emperor Henry VI expected to be succeeded by his infant son Frederick as king of Sicily, king of the Germans, and Roman Emperor, a combination that would have brought Germany, Italy, and Sicily under a single ruler and left the patrimonium exceedingly vulnerable. The early death of Henry VI left his 3-year-old son Frederick II as king. Henry VI's widow Constance of Sicily ruled over Sicily for her young son before he reached the age of majority. She was as eager to remove German power from the kingdom of Sicily as was Innocent III. Before her death in 1198, she named Innocent as guardian of the young Frederick until he reached his maturity. In exchange, Innocent was also able to recover papal rights in Sicily that had been surrendered decades earlier to King William I of Sicily by Pope Adrian IV. The Pope invested the young Frederick II as King of Sicily in November 1198. He also later induced Frederick II to marry the widow of King Emeric of Hungary in 1209. After the death of Emperor Henry VI, who had recently also conquered the Kingdom of Sicily, the succession became disputed: as Henry's son Frederick was still a small child, the partisans of the Staufen dynasty elected Henry's brother, Philip, Duke of Swabia, king in March 1198, whereas the princes opposed to the Staufen dynasty elected Otto, Duke of Brunswick, of the House of Welf. King Philip II of France supported Philip's claim, whereas King Richard I of England supported his nephew Otto. The confusion in the Empire allowed Innocent to drive out the imperial feudal lords from Ancona, Spoleto and Perugia, who had been installed by Emperor Henry VI. On 3 July 1201, the papal legate, Cardinal-Bishop Guido of Palestrina announced to the people, in the cathedral of Cologne, that Otto IV had been approved by the pope as Roman king and threatened with excommunication all those who refused to acknowledge him. At the same time, Innocent encouraged the cities in Tuscany to form a league, called the League of San Genesio against German imperial interests in Italy, and they placed themselves under Innocent's protection. The German princes have the right to elect the king, who is afterwards to become emperor. This right was given them by the Apostolic See when it transferred the imperial dignity from the Greeks to the Germans in the person of Charlemagne. The conflict was decided by the Battle of Bouvines on 27 July 1214, which pitted Otto, allied to King John of England against Philip II Augustus. Otto was defeated by the French and thereafter lost all influence. He died on 19 May 1218, leaving Frederick II the undisputed emperor. Meanwhile, King John was forced to acknowledge the Pope as his feudal lord and accept Stephen Langton as Archbishop of Canterbury. Innocent III played further roles in the politics of Norway, France, Sweden, Bulgaria, Spain and England. 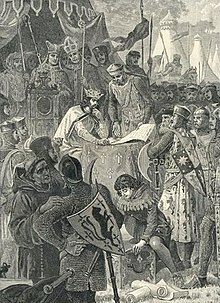 At the request of England's King John, Pope Innocent III declared the Magna Carta annulled, resulting in a rebellion by the English Barons who did not accept this action. Innocent III was a vigorous opponent of religious heresy and undertook campaigns against it. At the beginning of his pontificate, he focused on the Albigenses, also known as the Cathars, a sect that had become widespread in southwestern France, then under the control of local princes, such as the Counts of Toulouse. The Cathars rejected the Christian authority and the teachings of the Catholic Church, claiming it corrupt. In 1198, Innocent III dispatched a monk named Rainier to visit France with the power to excommunicate heretics, and orders to local temporal authorities to confiscate the lands of heretics or to "as became Christians to deal with them more severely." The murder of Pierre de Castelnau – Innocent's legate – in 1208, by unknown assailants commonly believed to be friends of Count Raymond of Toulouse (who was not a Cathar himself but was seen as supportive of them), caused Innocent to change his methods from words to weapons. Innocent called upon King Philip II Augustus of France to suppress the Albigenses. The Crusade was prosecuted primarily by the French crown and soon took on a political flavor, resulting in a significant reduction in the number of practising Cathars and realignment of the County of Toulouse in Languedoc, bringing it into the sphere of the French crown and diminishing the distinct regional culture and high level of influence of the Counts of Barcelona. Under the leadership of Simon de Montfort, 5th Earl of Leicester, a campaign was launched. The Albigensian Crusade, which led to the deaths of approximately 20,000 men, women and children, Cathar and Catholic alike and brought the region firmly under the control of the king of France. It was directed not only against heretical Christians, but also the nobility of Toulouse and vassals of the Crown of Aragon. King Peter II of Aragon was directly involved in the conflict, and was killed in the course of the Battle of Muret in 1213. The conflict largely ended with the Treaty of Paris of 1229, in which the integration of the Occitan territory in the French crown was agreed upon. Burning of the Waldensians. Toulouse in the 13th century. Pope Innocent III spent a majority of his tenure as Pope (1198–1216) preparing for a great crusade on the Holy Land. His first attempt was the Fourth Crusade (1202–1204) which he decreed with the papal bull Post miserabile in 1198. 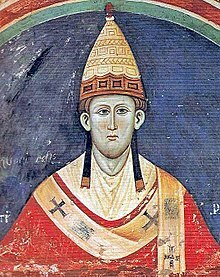 Unlike past popes, Innocent III displayed interest in leading the crusade himself, rather than simply instigating it and allowing secular leaders to organize the expedition according to their own aspirations. Innocent III's first order of business in preaching the crusade was to send missionaries to every Catholic state to endorse the campaign. Innocent III sent Peter of Capua to the kings France and England with specific instructions to convince them to settle their differences. As a result, in 1199, Innocent was successful in forging a truce of five years between the two nations. The intent of the truce between the kings was not to allow them to lead the crusade, but rather to improve the likelihood that they would provide assistance. For the army's leadership, Innocent aimed his pleas at the knights and nobles of Europe. The pleadings were successful in France, where many lords answered the pope's call, including the army's two eventual leaders, Theobald of Champagne and Boniface, marquis of Montferrat. Innocent III's calls to action were not received with as much enthusiasm in England or Germany. For this reason, the Fourth Crusade became mainly a French affair. The Fourth Crusade was an expensive endeavor. Innocent III chose to raise funds by doing something previously unheard of in popes. He forced the entire clergy under his leadership to give one fortieth of their income in support of the Crusade. This marked the first time a pope ever imposed a direct tax on his clerical subjects. The pope faced many difficulties with collecting this tax, including corruption of his own officials and disregard by his subjects in England. He continued in his attempt to garner funds for his crusade by sending envoys to King John of England and King Philip of France. Both men pledged to contribute one fortieth of their own salaries to the campaign[dubious – discuss]. John also declared that the tax would be collected throughout England as well. The other source of funds for the crusade was the crusaders themselves. Innocent declared that those who took the vow to become crusaders but could no longer perform the tasks that they had promised to complete, could be released of their oaths by a contribution of funds to the original cause. The pope put Archbishop Hubert Walter in charge of collecting these dues. Innocent viewed the capture of Constantinople as a way to reunite the schismatic Catholic and Eastern Orthodox Churches. The pope excommunicated the Crusaders who attacked Christian cities, but was unable to halt or overturn their actions. Erroneously, he felt that the Latin presence would bring about a reconciliation between the Eastern and Western Churches. His tactics ultimately failed due to the significant differences between the two churches. The crusade did lead to the start of the Latin Empire's rule of Constantinople, which lasted for the next sixty years. In 1209, Francis of Assisi led his first eleven followers to Rome to seek permission from Pope Innocent III to found a new religious Order, which was ultimately granted. Upon entry to Rome, the brothers encountered Bishop Guido of Assisi, who had in his company Giovanni di San Paolo, the Cardinal Bishop of Sabina. The Cardinal, who was the confessor of Pope Innocent III, was immediately sympathetic to Francis and agreed to represent Francis to the pope. Reluctantly, Pope Innocent agreed to meet with Francis and the brothers the next day. After several days, the pope agreed to admit the group informally, adding that when God increased the group in grace and number, they could return for an official admittance. The group was tonsured. This was important in part because it recognized Church authority and protected his followers from possible accusations of heresy, as had happened to the Waldensians decades earlier. Though Pope Innocent initially had his doubts, following a dream in which he saw Francis holding up the Basilica of St. John Lateran (the cathedral of Rome, thus the 'home church' of all Christendom), he decided to endorse Francis's Order. This occurred, according to tradition, on 16 April 1210, and constituted the official founding of the Franciscan Order. The group, then the "Lesser Brothers" (Order of Friars Minor also known as the Franciscan Order), preached on the streets and had no possessions. They were centered in Porziuncola, and preached first in Umbria, before expanding throughout Italy. On 15 November 1215 Innocent opened the Fourth Lateran Council, considered the most important church council of the Middle Ages. By its conclusion it issued seventy reformatory decrees. Among other things, it encouraged creating schools and holding clergy to a higher standard than the laity. Canon 18 forbade clergymen to participate in the practice of the judicial ordeal, effectively banning its use. Innocent III, however, died suddenly at Perugia on 16 July 1216. He was buried in the cathedral of Perugia, where his body remained until Pope Leo XIII had it transferred to the Lateran in December 1891. ^ Moore, John (2003). Pope Innocent III (1160/61 – 1216): To Root Up and to Plant. Leiden, Boston: Brill. pp. 102–134. ISBN 90 04 12925 1. ^ a b c d e f g h "Catholic Encyclopedia: Pope Innocent III". Newadvent.org. 1 October 1910. Retrieved 17 February 2010. ^ Innocentius III. "On the misery of the human condition, De miseria humane conditions". Open Library. Retrieved 23 August 2012. ^ "LOTARIO DEI CONTI DEI SEGNI [POPE INNOCENT III], De miseria humanae conditionis [On the Misery of Human Condition] In Latin, manuscript on parchment likely Italy, c. 1250" (PDF). LES ENLUMINURES, LTD. 2006. Retrieved 13 January 2011. ^ Schmitt, C. B. (1988). The Cambridge history of Renaissance ... – Google Books. ISBN 9780521397483. Retrieved 17 February 2010. ^ See Julien Théry-Astruc, "Introduction", in Innocent III et le Midi (Cahiers de Fanjeaux, 50), Toulouse, Privat, 2015, pp. 11–35, at pp. 13–14. ^ "Magna Carta: people and society". British Library. Retrieved 23 January 2017. ^ "Fourth Lateran Council: 1215". Papal Encyclicals Online. ^ a b c d e Cheney, Christopher R. (1976). Innocent III and England. Stuttgart: Anton Hiersemann. ^ "Medieval Sourcebook: Twelfth Ecumenical Council: Lateran IV 1215". Fordham.edu. Retrieved 17 February 2010. ^ "Lateran 4 – 1215". ^ "School of Theology". Sthweb.bu.edu. 2 September 2009. Archived from the original on 3 July 2009. Retrieved 17 February 2010. (in French) Théry-Astruc, Julien, "Introduction", in Innocent III et le Midi (Cahiers de Fanjeaux, 50), Toulouse, Privat, 2015, pp. 11–35. Kendall, Keith. "'Mute Dogs, Unable to Bark': Innocent III's Call to Combat Heresy." In Medieval Church Law and the Origins of the Western Legal Tradition: A Tribute to Kenneth Pennington, edited by Wolfgang P. Müller and Mary E. Sommar, 170–178. Washington, D.C.: The Catholic University of America Press, 2006. Wikimedia Commons has media related to Pope Innocent III. "Innocentius III papa". Repertorium "Historical Sources of the German Middle Ages" (Geschichtsquellen des deutschen Mittelalters). Meister Eckhart und seine Zeit – Päpste – Innozenz III. Deed by Innocence III for the Stendal Cathedral Chapter, 6 May 1206, "digitalised image". Photograph Archive of Old Original Documents (Lichtbildarchiv älterer Originalurkunden). University of Marburg.